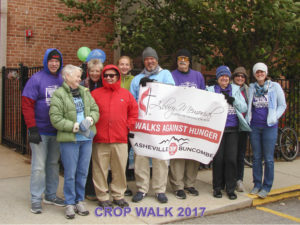 Thanks to all those who spent a very frigid afternoon walking to raise money and awareness of hunger in our area at Asheville’s CROP Walk yesterday. Thanks also to those from the church and community who gave so generously to this cause. Because of your efforts there will be fewer folks that are hungry in our area! Remember, we are still collecting beans for MANNA Food Bank. Please bring dried or canned beans to worship with you and place them in one of the large red bins at the doors to the sanctuary and fellowship hall. Together, we are doing all we can to feed the hungry in our area!